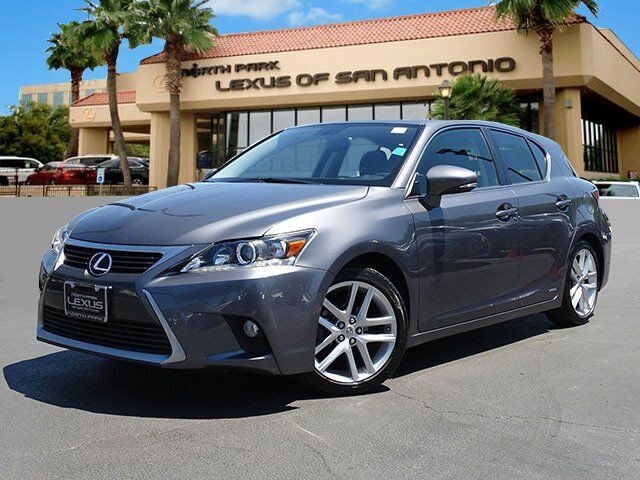 CARFAX 1-Owner, L/ Certified, GREAT MILES 11,309! EPA 40 MPG Hwy/43 MPG City! Heated Seats, Sunroof, Onboard Communications System, CD Player, Dual Zone A/C, Keyless Start, iPod/MP3 Input, SEAT COMFORT PACKAGE, Alloy Wheels SEE MORE! Sunroof, Hybrid, Satellite Radio, iPod/MP3 Input, CD Player, Onboard Communications System, Aluminum Wheels, Keyless Start, Dual Zone A/C Rear Spoiler, MP3 Player, Keyless Entry, Remote Trunk Release, Child Safety Locks. BACKUP CAMERA MOUNTED IN AUTO-DIMMING REARVIEW Compass, SEAT COMFORT PACKAGE 4-way power front passenger seat and heated front seats. Lexus Hybrid with NEBULA GRAY PEARL exterior and BLACK interior features a 4 Cylinder Engine with 134 HP at 5200 RPM*. Electronic Stability Control, Brake Assist, 4-Wheel ABS, 4-Wheel Disc Brakes, Tire Pressure Monitoring System Great Gas Mileage: 43 MPG City. Edmunds.com explains "What really sets the CT 200h apart from other luxury or luxury hybrid vehicles, however, is its fuel-efficient gasoline-electric hybrid powertrain that delivers an impressive EPA fuel economy rating of 42 mpg combined. ".